Welcome one and all and may the light shine upon all of you! This will be our general Q&A thread for the Wheel of Time game. In this particular post I hope to tell you all a little about the world and list off some of the classes and nationalities that you can play. Everyone is welcome to create their own character, or tell me what they wanted to play and I'll create the actual character. The rules are based off of the D&D Version 3, so those of you familiar with that should not have a difficult time picking up the rules. Alright, lets get started! Magic: I think it would be best to start out by discussing how magic is done in the WoT. It is unlike any other system or story I've ever read or seen. In fact, it isn't even called magic in world, it is called Channeling the One Power (or True Source). There are two different sides to the One Power, saidar and saidin. Only men are able to touch saidin and women saidar. Saidin and saidar are vastly different from each other, both in the way its controlled and how it is used. Because of this, women cannot teach men how to channel saidin, and men cannot teach women how to channel saidar. For example, when a woman that is able to channel the One Power wants to channel, she is said to embrace saidar. In order for a woman to get saidar to do what she wants, she has to completely surrender to it and gently guide it. Men, on the other hand, have to seize saidin. They have to wrestle with it and force it to do what they want. Often, in the books, it is compared to fighting for your life, and if you make one mistake, relax for one moment, then saidin will consume you. Both saidin and saidar are broken up into five different threads, that of Earth, Wind, Water, Fire, and Spirit. In order to do things with the One Power, channelers must "weave" these different threads of the power into a "weave". Such as weaving a fireball, the channeler must use threads of both Fire and Air and weave them in a specific way. How a man weaves a fireball will differ from how a women weaves a fireball, but both of them will use threads of Fire and Air. Channeling isn't something that everyone can learn. Of those that can learn, a very few have "the spark born in them" which means whether or not they are taught, they will Channel. If those with "the spark" are not taught, often times the One Power (or colloquially, the Power) will destroy them as they are not able to control it. A few of those with "the spark" may learn to control their abilities without being taught, and they are called Wilders. Wilders usually have a block which is something that they've created in their mind that only allows them to channel under specific circumstances, often because they do not realize that they are channeling. For instance, one character in the book, Nynaeve al'Meara, was a wilder, and she could not channel unless she was angry. Long ago, during the Age of Legends, in order to end of the War of Power, and Aes Sedai ("Servant of All" in the old tongue) by the name of Lews Therin Thelamon (also known as Kinslayer or The Dragon) led the 100 companions to Shayol Ghul to seal the holes bored in the Dark Ones prison. Unfortunately, he was unable to convince any women Aes Sedai to come with him, and as such the Dark One was able to get in the final word. The Dark One tainted saidin, the male half of the True Source, causing all male Aes Sedai to go mad with the One Power, effectively Breaking the World, and bringing the Age of Legends to a close. The Taint is still present in the Third Age (the Age we will be playing in) and as such, male channelers are hunted down and "gentled", which means they are cut off from the One Power (This often results in the channeler losing the will to live and eventually either taking his own life, or wasting away. The female equivilant is called being Stilled.) It varies how long a man can channel before going mad, sometimes within a year, sometimes it takes 10. If a channler overextends themselves, then they are in danger of Burning Out. They essentially scorch the ability to channel from themselves and find themselves in a situation not unlike being gentled or stilled. The most well known, and often believed to be the only, institute where channeling is taught is the White Tower in Tar Valon. There reside the descendants of the Aes Sedai from the Age of Legends, now an exclusively female group. I will discuss Aes Sedai more in another section. Channelers often live a much longer time then normal folk, some even past 400 years old. They're aging begins to slow, so a channeler of 90 years old may only look to be in their late twenties. Aes Sedai: As mentioned before, today's Aes Sedai are descendants of the Aes Sedai from the Age of Legends. Now a female only group, Aes Sedai refer to each other as "Sisters" and are notorious for their political maneuverings and power. Marked by their seemingly ageless face and "Aes Sedai tranquility," many people find themselves on one side or another when it comes to Aes Sedai. Either one trusts them, believes that they know best and will do as they are told, or they deeply distrust Aes Sedai, and look try to look at even the simplest statement from 20 different sides to find how they are being tricked. No matter which side a commoner falls on, however, there is always a healthy amount of caution or even fear. It is most definitely unwise to anger an Aes Sedai. To become an Aes Sedai, a hopeful women (usually between the ages of 16 to 1 would need to travel to the tower and first be excepted as a Novice. After she has proven herself to be adequately knowledgable and strong enough in the One Power, she takes a test to become an Accepted and is given a golden Great Serpant ring which is required to be worn on the third finger of her left hand. After she has progressed far enough in her studies and the Aes Sedai believe she is ready, she takes another test and becomes a full Aes Sedai. Once she passes this test she takes the Three Oaths on the a ter'angreal called the Oath Rod which prevents her from ever being able to break those oaths. The Three Oaths are "To speak no word that is untrue, to make no weapon with which one man may kill another, and to never use the One Power as a weapon except against Darkfriends or Shadowspawn, or in the last extreme defense of her life, the life of her Warder, or another Aes Sedai." After taking the Three Oaths, she is then "raised to the shawl" and is allowed to wear the Great Serpant ring on whichever finger she so chooses. The now Aes Sedai then gets to apply to join one of the seven Ajahs. An Ajah is essentially a sect of the White Tower, each with its own distinct purpose. There are the Blue, Green, Yellow, Gray, Red, White, and Brown Ajahs, as well as the unofficial Black Ajah. The Blue Ajah concerns itself with the worlds problems, sending Sisters out into the world to help specific causes. The Green Ajah is otherwise known as the Battle Ajah. The only Ajah that allows the Sisters to have more than one Warder, they stand ready to face the Dreadlords during Tarmon Gai'don (the Last Battle, during which the Dragon Reborn will die to seal away the Dark One, or the Dark One will break free and destroy the world.) During the Trolloc Wars, there wasn't an army marching that didn't have a Sister from the Green Ajah with them. The Yellow Ajah concern themselves with healing sicknesses of the body and mind. The Gray Ajah are negotiators. They work to broker treaties and deals to prevent wars before they happen. The Red Ajah are have one singular purpose, which is to track down men that can channel and gentle them. Red Sisters do not take Warders and are often disdainful of men. The White Ajah focuses purely on the pursuit of logic, philosophy, and reason. They often tend towards emotionless viewpoints and decisions based solely off of what is logical. The Brown Ajah are concerned with the gathering and preservation of knowledge. Often times they are so wrapped up in their thoughts or research that they don't notice the going ons of the world around them. The Black Ajah is an Ajah full exclusively of Darkfriends (People sworn to serve the Dark One.) The quickest way to get on the bad side of an Aes Sedai is to even suggest that the Black Ajah exists, as many Aes Sedai claim that it does not. Aes Sedai of most Ajahs may bond a Warder. A Warder is a man that is tied to a sister through the One Power. The Aes Sedai and her Warder always know where each other are, as well as feel any strong emotions or pains that the other experiences. This is effected by distance however, and the further away they get the more vague the feelings become. Warders often gain increased endurance and resistance to pain through this bond. When an Aes Sedai dies, her bonded Warder often lose their will to live, and get themselves killed trying to avenger her. When an Aes Sedai's Warder dies, the Aes Sedai is wracked with incredible grief for months afterwards. The Aes Sedai and the White Tower are led by the Amrylin Seat and the Hall of the Sitters, both of whom are constantly locked in a battle to determine who will actually lead the White Tower. Asha'man: Asha'man are the male equivalent of Aes Sedai. Founded by the Dragon Reborn, Rand al'Thor, and led by the M'hael, Mazrim Taim, the Asha'man enter the Black tower as Soldiers. They undergo extreme and brutal training, and casualties are not unheard of. After advancing far enough, the Soldiers are given a silver sword pin to wear on their collar and they are given the rank of Dedicated. After further training, they will get a golden dragon pin to wear on the other side of the collar and they are full Asha'man. Training at the Black Tower is much more militaristic then the White Tower, and madness is always on the horizon. When someone at the Black Tower goes mad, something is slipped into their drink and they peacefully drift away to death. Many Asha'man consider this a kindness. General Culture: So, Wheel of Time's whole deal is that Time is cyclical. An age will come, pass, be forgotten, then come again. It is this constant battle between the Dark One and the Light. It is this unbroken pattern woven by the wheel of time, indeed, it is not uncommon to hear someone say "The Wheel weaves as the Wheel weaves." A saying meaning that whatever will come will come, no matter what anyone does. It is said that the Dark One resides outside of the Wheel, and if he gets his way he will destroy it and remake it in his own image. Although talk of the Dark One is considered bad luck, and mentioning his name, Shaitan, will turn his attention onto you. The Dark One and the Forsaken are said to be bound in his prison at Shayol Ghul, although (unbeknownst to the common folk) the Seals to the Dark Ones prison are weakening and the Forsaken have escaped. There are many prophecies in the Wheel of Time, but the most important one is the Prophecies of the Dragon (or the Karaethon Cycle.) It is said that Lews Therin Thelamon, the Dragon, will be reborn and fight Tarmon Gai'don, bringing about a new breaking of the world, and sealing away the Dark One. There are many different omens to indicate that the Dragon has been Reborn, but the most blatant one, the one that would cause most people to acknowledge that the Dragon Reborn had arrived, would be the Stone of Tear falling and the Dragon Reborn will wield Callandor. Shayol Ghul is the point where the Dark Ones prison meets our world in the pattern, although many just think that it is actually where the Dark One actually resides. It is in the Blight, which is a place where the nature has gone... wrong. Or sick. Even more dangerous than the Aiel Waste, it is where the Darkspawn reside and other nasty creatures (from bloodthirsty trees, to giant, practically impossible to kill, worms) are rampant. Slowly each year the Blight creeps slowly downward. There are many other more specific details depending on what nation you are talking about, I'll try to briefly cover those when I get to the different nationalities you can be. World History: Long, long ago, there was the Age of Legends. During this age, the One Power was used to do amazing and wonderous things and both men and women Aes Sedai where the most respected of individuals. In fact, things were so good for so long that the Dark One was forgotten to have exsisted. However, in the arrogance of the Age, a bore was drilled into the Dark Ones prison and he was allowed to touch the world. This began the War of Power, some Aes Sedai turned to the Dark One, 13 of the most powerful becoming known as the Forsaken. The War of Power saw the creation of Trollocs (half animal, half human abominations. They are the most common of the Darkspawn) and Myrddraal (Frighting creatures, they resemble pale men with no eyes or eye sockets. They tended to be the Captains of Darkspawn armies) and other unholy abominations before Lews Therin Thelamon, The Dragon, The Lord of the Morning, led the 100 Companions to Shayol Ghul where they caught the Forsaken and sealed them away in the Dark Ones prison, leaving 7 seals made of Cuendillar (an unbreakable, powerwrought material) as the focal points of the Power used to seal them. However, as mentioned above, the Dark One was able to taint saidin, causing all the male Aes Sedai to lose their minds and destroy the world. This time was known as the Breaking of the World. Indeed, the breaking was so powerful that the very landscape of the world was changed. New continents were raised from the ocean, and entire pieces of land were swallowed up in return. People were scattered and for a long time the world was dark, dangerous and chaotic. Eventually 10 Nations arose from the ruins of the world and civilization seemed to begin again. However, this tragically ended when Darkspawn armies invaded, leading to the beginning of the Trolloc Wars. Eventually, the Trollocs where repelled and 29 new nations arose from the ashes of the original 10. After some more warring, the 29 nations eventually became united under Artur "Hawkwing" Paendrag, creating a united empire. Hawkwing then sent armies across the Aryth Ocean to colonize, while laying seige to Tar Valon. Artur Paendrag dies, however, apparently only able to be saved by Aes Sedai of who he despises. The following 100 years sees only war, as one person or another tries to take control of the empire. The end result was many of the nations we have today. Most recently, the greatest conflict seen was about 20 years ago when the Aiel came over the Spine of the World to kill King Laman Damodred of Cairhien for cutting down the Chora Tree to make a throne. Many nations joined forces to repel the Aiel, but the Aiel chased King Damodred to Tar Valon before finally killing him and then leaving. The Forsaken: Half history, half legend, the Forsaken are often used by as a threat by mothers to get misbehaving children to behave. There are thirteen of them: Ishmael, Rahvin, Demandred, Sammael, Aginor, Balthamel, Asmodean, and Be'lal where the male ones, and Lanfear, Greandal, Moghedien, Semiraghe, and Mesaana were the female. They committed great atrocities during the war of power before Lews Therin was able to seal them away. Okay, so I know that was a lot. Feel free to read at your pleasure, or not and just experience the game. If you have any questions feel free to post them here! Now we are going to cover some of the different classes and backgrounds you can have for your characters. In the interest of not making this post more ridiculously long than it already is, I will be very brief with the nationality descriptions and then I can go more in depth with the ones that are selected if desired. So each nationality, or background, gets a choice out of a list of background feats and background skills. I'm going to include a link to the rule book I have so that you all can take a close look if you want. All of these backgrounds (with the exception of Ogier) are human. Aiel: A tough and violent people, they reside in the barren and harsh Aiel Waste. They are tall, with typically red or blond hair, and blue or gray eyes. Every Aiel knows how to fight if needs be, but most of the fighting is either done by the Algai'd'siswai or Far Dareis Mai (The Maidens of the Spear.) Blacksmiths and Wise Ones will not participate in combat, and you will never see Aiel holding a sword. They fight with shortbows or short spears typically. Their entire culture is governed by Ji'e'Toh, which is a incredibly complicated system of honor and obligation. Before the Aiel kill, they veil their faces. Atha'an Miere (Sea Folk): Dark skinned and tattooed, these people live for the sea. Their entire lives revolve around the sea, in that they are born on a ship (in fact, if a pregnant women is shore bound, she will specifically go out to sea to give birth), they live most their lives aboard ships, and, when they die, they are given to the sea. They refer to their ships as "him" or "he" and are incredibly rigid in their social status and order, and even more rigid and unforgiving in negotiating trade. Borderlander: Borderlanders actually refer to four seperate nations -- Saldea, Kandor, Arafel, and Shienar -- who border the blight. Each country has slightly different culture, but all have a militaristic mindset and deeply seated senses of duty and honor. They are the defenders against the Blight and rarely does a week go by without Trolloc raids or attacks in their lands. Cairhienen: These people tend to be smaller in stature, with pale complexions. They are a reserved and subtle people, but great players of Daes Dae'mar (the Game of Houses) which is full of political maneuverings, assassinations, and that sort of thing. They were originally the only nation to be allowed passage through the Aiel Waste, however, that ended with Laman's Sin and the Aiel War. Although, it is said that Cairhienen festivals can be surprising wild and uncouth. Domani: These people hail from Arad Doman, a land well known for their women and hedonistic ways. Domani women have a reputation of being some of the most beautiful, intoxication women alive. Indeed, mothers teach daughters the way of seduction almost from the day they are old enough understand it. Domani men also have this reputation, but to a much lesser extent. Indeed, Domani men are known more for their temper then anything else. Ebou Dari: Hailing from the land of Ebou Dar, the people are generally polite, and rather easygoing... if you are able to keep track of their elaborate code of etiquette. Once you cross a line, however, you are very likely going to find yourself in a duel. Upon marriage, the man presents a marriage knife to his wife, asking her to kill him with it if he ever displeases her. While it is not likely for her to actually kill him, it is not unthinkable for her to give him a cut or two with that marriage knife that usually hangs around her neck. Illianer: The people of Illian prosper mainly due to the booming sea trade they are able to provide. They have a strong hatred for Tairens due to many wars that have been fought and the general competition for sea trade that the Tairens provide. It is in style for Illianers to wear a thick beard with no moustache, and they have a very distinct accent. Midlanders: These people hail from the nations and cities in the center of the Westlands. Nations and cities such as Andor, Far Madding, Murandy, Ghealdan, and the towns along the Caralain Grass and river Manetherendrylle, such as the Two Rivers and Baerlon. Midlanders are your salt of the earth type people. The ones that work hard and could teach mules how to be stubborn. They have indominable spirits and will always pick themselves up and get back to work after hard times hit. Seanchan: The Seanchan are unlike any other nation in the Westlands. Indeed, although their origin dates all the way back to the armies that Artur Hawkwing sent across the ocean, these people's culture is starkly different. They see channeling as a wild and dangerous thing, and as such they catch any woman who can channel and force her to wear a ter'angreal called an a'dam. This allows some women, known as Sul'dam to control how the wearer acts. The woman forced to wear the a'dam is called the damane, and she is treated like property. Like a pet, and many damane that have been born and raised Seanchan act like one. The Nobility of the Seanchan is called the Blood, and they are said to have descended from Artur Hawkwing's son, Luthair Paendrag. The Seanchan has travelled back from across the Aryth Ocean to reclaim the lands they believe to be stolen from Artur Hawkwing's empire. Tairen: The people of Tear like a clear distiction in the classes. Nobles and Commoners do not mix, and the Nobles certainly get their way. The style for nobles is to where a pointed goatee and sleak moustache. Tairen law forbids channeling, although it isn't a crime to be able to channel like it is in Amadicia, and Aes Sedai are generally mistrusted. In Tear itself lies the Stone of Tear, a fortess of untold magnitude, you would be forgiven for mistaking it for a small mountain. Said to have been built using the one power near the end of the Breaking of the World, it has never fallen, although the Prophecies of the Dragon say that when the Dragon Reborn comes, it will fall. Tar Valoner: Much like the Midlanders, the people of Tar Valon are hardworking, adaptable, and dependable. However, unlike the Midlanders, Tar Valon people tend to have much more diversity and world knowledge. 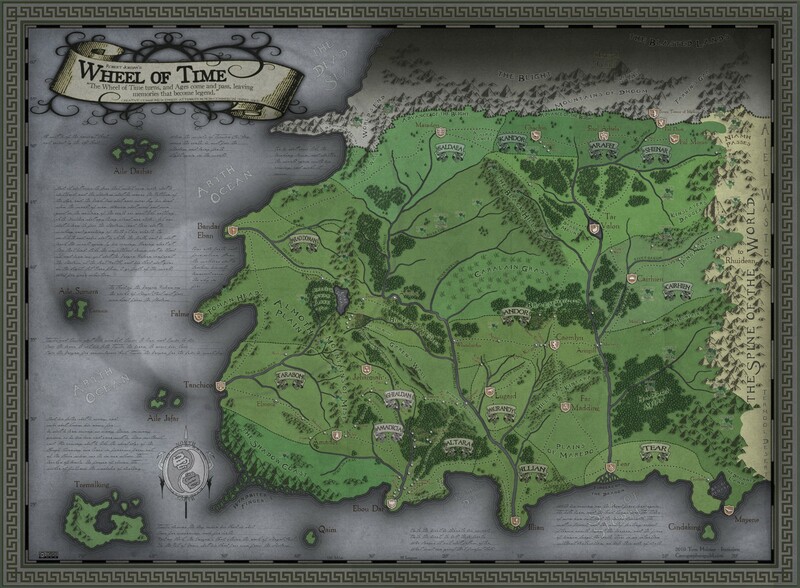 The White Tower itself lays at the center of Tar Valon, and those within the city see the tower as the protector and diplomatic might that it is and trust Aes Sedai almost explicitly. Taraboner: Taraboners are known mostly for the fact that they find it rude to show their face in public except for eating and drinking. Because of this, they tend to wear veils. They have a great pride in their heritage, flouting the fact that their rulers can trace their ancestory back to the Age of Legends. Although, not to the extent of Arad Doman, they do tend to have a tendency towards lifes pleasures. Indeed, much of their entertainment takes place inside large stadiums where anything from a non-lethal gladiator match to an Illuminators display can be shown. Ogier: These non-human creatures live for many, many years, not even considered an adult until they are 100 years old. Although they are renowned stonemasons, what Ogier really care for are the trees. Ogier reside in Steddings, places where Shadowspawn cannot enter, no one is able to channel, and violence is forbidden. In fact, if an Ogier stays away from a Stedding for too long, they begin to feel a Longing. If the Ogier ignores this Longing and does not visit a Stedding, it will kill them. Due to their long lives, Ogier consider humans to be very hasty. They themselves are very patient, caring, and calm, although an enraged Ogier is an enemy you'd best not underestimate. Ogier have the same bodily proportions as a human, although they are 8 to 10 feet tall, have long ears with little tufts of hair at the end that will twitch with their mood, bushy drooping eyebrows, and broad flat noses. Alright, that was the different backgrounds you can have. If you want a little more in depth information about them feel free to ask me! Algai'd'siswai: These Aiel warriors come from the Aiel Waste, or the Three Fold Land as they call it. They wear no armor and refuse to touch swords, instead using short spears, knifes, and short bows to get the job done. Females in this class would be referred to as Far Dareis Mai, or a Maiden of the Spear. The Algai'd'siswai differs from an Armsmen in that it focuses more on speed, agility, and skill to get the job done then strength and armor. Armsmen: This class is your typical fighter type deal. Whether he be a Whitecloak, or just a city guardsman, he would fall under this class. Initiates: This class would entail those that wish to become Aes Sedai or Asha'man. Channelers that focus on their intelligence and training to defend themselves and others. Keep in mind, however, that if you wish to play a male channeler, then you will be dealing with the possibilty of going mad. Noble: A noble will fill the role that a bard would typically have. Focusing on intelligence and charisma, while a Armsmen may charge in, the noble might be the one to talk his way out. Wanderer: A mixed bag of people, the wanderer typically encompasses one who focuses on a nimble mind and nimble fingers to make his way in the world. Although it doesn't appear to be a direct correlation, this class seems most like the rogue equivilant. Wilder: A wilder is someone who learned to channel by themselves. Not subjected to the rules or rigors of an official training regime, the wilder learned from experience, trial, and error. Without the training to fall back on, Wilders know less weaves then Initiates, but they have a easier time overchanneling. Woodsman: Capable in combat and proficient with a variety of weapons, woodsmen tend to be protectorates. Helping those transit in their terrain, a woodsman knows how to survive off of the land, find his prey, and avoid being seen. Woodsmen don't necessarily need to be experts of the woods, any terrain that works with character history could do just as well. Alright, that was a lot. Below I've included a map of the world. Let me know if you would like to create your own character, or just give me the character details and have me create it. I look forward to starting the game, guys! Description: Standing at an above average height, Lanur Dinas strikes a wild figure. Salt and pepper hair hangs loosely about his shoulders draping his craggy features. His mustaches almost hide his lips altogether and his beard is untamed, reaching down to the middle of his chest. His bare skin is deeply tanned and heavily creased and weathered but his eyes are young and sharp, though gray as a misty morning sky. Wearing clothing of cured deerskin mixed with more "civilized" leather garb, he carries with him a shortbow of dark gray, plain wood with a quiver at his right hip while at his left hip hangs a longsword. He wears a thick-bladed, 12-inch knife across the front of his belt in a tooled leather sheath. Over his explorer's clothing, Lanur wears studded leather armor, simple in design with no embellishments and blackened studs. Aside from his weapons, he carries with him a backpack made of thick, waterproofed leather on a wooden frame underneath which is tied his bedroll and a thick rope. A two-man tent is bundled up tightly and strapped to the top. Posted on 2018-10-08 at 20:17:11. Posted on 2018-10-17 at 12:17:15. ...I think I've settled on an Ebou Dari smuggler as a character. Giddy's gonna do something witha character sheet and shoot it back my way, soon, I think. Posted on 2018-10-17 at 12:32:28. The Wheel weaves as the Wheel weaves. Posted on 2018-10-17 at 12:58:40. I haven't done anything just yet for a character. I will and hope to get something in soon. Anything you folks think the party really needs? I may fill a need or I may just do soemthing completely different. Who knows. Posted on 2018-10-17 at 16:25:33. Also - I just realized that that big blue text in the first post of this thread is a link to a rulebook! Whaaaaaaat?!?!? I'm snagging and reading, yo! Posted on 2018-10-17 at 16:45:35. And I am a caster--wilders, I believe, are casters who didn't go to casting school. There are other types. Posted on 2018-10-17 at 16:55:23. Yup, the book is there! Yeah, Wilders are people who can channel but haven't had any formal training. Wanderers are not able to channel. Eol, If you see anything in the book that changes what you would like to play, let me know! For now I'll move forward with making you an Ebou Dari smuggler. I'll make your character last so feel free to take your time! I hope to have all the characters made and be ready to go by next friday! I'm looking forward to it, guys! Posted on 2018-10-17 at 17:31:28. I was just reading up on the Ebou Dari and I think they're just about perfect! As I was reading, in fact, it occurred to me that, as a people, they almost remind me of the Braavosi from A Song of Ice and Fire (Game of Thrones) series... Then it occurred to me that Martin probably stole the Ebou Dari from Jordan and made them the Braavosi! Either way, I love the idea of an Ebou Dari smuggler! Already starting to formulate his looks and mannerisms. P.S. I missed the "wilder" part on Bree's concept... The perils of reading on a tiny phone screen vs a giant monitor, I suppose. Gol-ding old dude eyes, anyway!!! Posted on 2018-10-17 at 17:47:27. Oh, I get you! Those tiny phone screens are absolute murder on the eyes! Posted on 2018-10-17 at 21:54:29. I don't know what you two are griping about. That's where I do most of my reading. Posted on 2018-10-18 at 10:32:32. I'm not really griping... more just admitting that I need a bigger phone. Posted on 2018-10-18 at 10:35:33. Ah! Getting old. Got it. Posted on 2018-10-22 at 12:03:34. Ok, reading and working on things now! I will get this taken care of! Posted on 2018-10-22 at 18:47:59. Posted on 2018-10-22 at 19:02:52.